Tenant-related problems bug the landlords almost every day. It is due to this that many landlords reduce their rents for maintaining good tenants. However, reducing the rent or evicting the tenants might not always be the best course of action. While lower rent reduces the profitability of the landlords, evictions of bad tenants causing problems also can be expensive and can consume a whole lot of resources and time. If you are a landlord stuck with bad tenants, we are here to help. Below is a list of 7 most common tenant problems and how you can solve them. This is the most common bad tenant problem. If the tenant is not abiding by the lease agreement and fails to pay monthly dues, it is very important for you to get in touch with them and have a face-to-face meeting. Tell them about the legal consequences if they continue to not pay the rent and make it clear that they can be evicted from the home. When the problem is made very realistic and imminent for them, they will probably start paying the rent. While we all do face financial problems at times, do not tolerate this for several months. While initial screening of tenants is very important to eliminate a number of tenant-related problems, it cannot completely prevent the future disputes between neighbors. It is generally recommended that you should allow all the tenants and neighbors to resolve their disputes on their own. However, if both the parties are just not ready to cooperate, it is the job of the landlord to step in and look for a solution in a peaceful manner. One man’s music is another man’s noise. The Right to Quite Enjoyment – to be able to work and sleep undisturbed – is what tenants pay rent for and must be respected by everyone for the rental or lease agreement to be honored. High tenant turnover rate can negatively impact your cash flow as it would require you to spend time and money on advertising as well as showing the home to potential tenants. Moreover, you’ll also be required to do background checks and other administrative work too. Some of the things that can help you reduce the turnover rate are prioritizing maintenance requests of the tenants, ensure that the rent is fair and try to be a good landlord to the tenants. If your property has appliances too, generally, as per the lease contract, the landlord is responsible for the appliances unless it is otherwise stated in the contract. So, make sure that you add a clause which states that while there are appliances in the property, replacing or repairing them is the responsibility of the tenant. This can protect you from regularly paying for repairs and replacements. It is a common belief that the security deposit can be used in place of the last month’s rent. However, tenants are generally required to pay some kind of additional expenses or past rent and the security deposit alone is not enough to pay last month’s rent as well other expenses. You can make it clear in the contract that the security deposit cannot be used to replace the rent of last month. A lot of landlords do not monitor utility payments until the tenant has already vacated the property. No matter if the utilities are in your name or that of tenants; ensure that everything is clearly mentioned in the agreement. For example, if there are utilities on your name and the tenant will pay for the same to you every month, make sure that it is clearly mentioned in the agreement and the tenant pays all of it before vacating the property. If at all, the tenant has made some alterations to your property without informing you, you have all the right to take legal help against them. Also, if the tenant is using the property for something illegal or something that is not allowed in the locality, you can report the same to appropriate authorities. 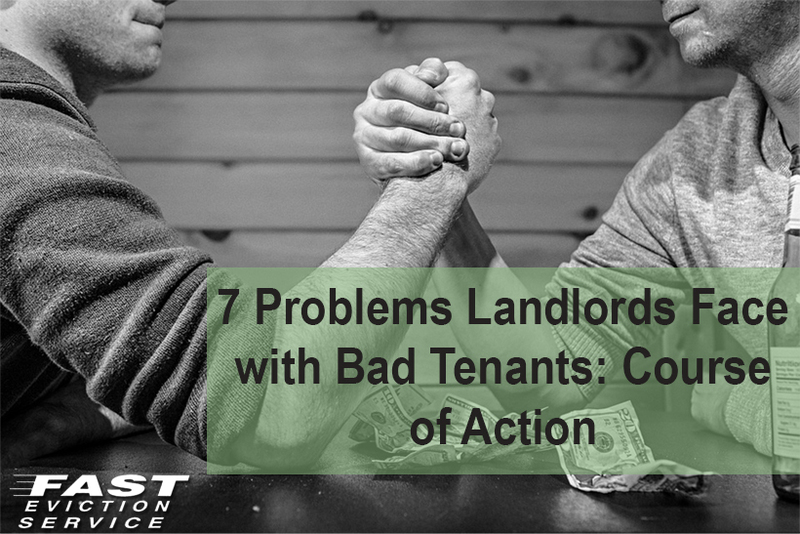 While the above-mentioned solutions should be good enough to solve most of your bad tenant-related problems, in extreme cases, eviction is the only solution. While giving a few chances to your tenant to improve their behavior is recommended, it is also very important to understand when it is time to let go a bad tenant that causes these types of problems. It is your property and you have every right to make sure that it remains just the way you like it and provides you with a steady source of additional income. What To Do If Your Tenant Stopped Paying Rent?